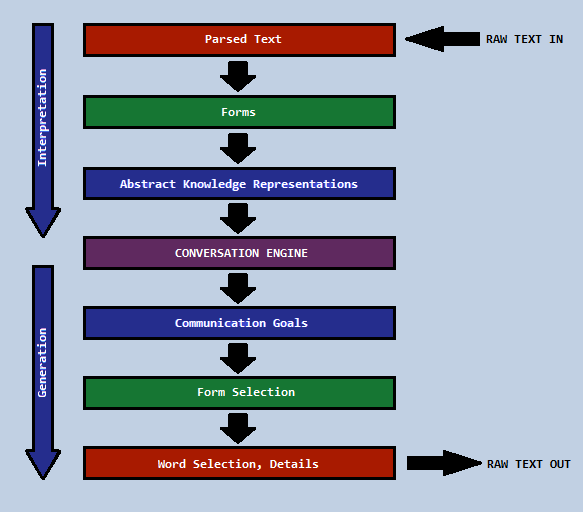 Which leads me into the next thing I put a lot of work into this month, namely, the code to start supporting the bottom half of this diagram: speech generation. Up until now, Acuitas has said very few things, and they've all been very formulaic … but my goal was always something beyond pre-formed sentences stored in a database. The new module I started on this month accepts inputs in the sort of abstract form that Acuitas stores in his database, then procedurally generates both questions and statements in natural English. 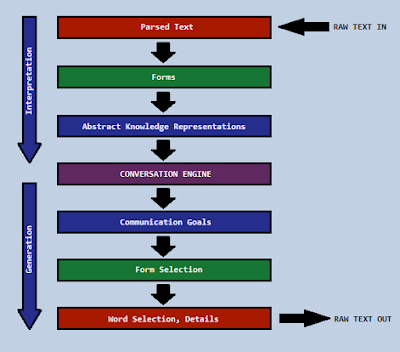 Verbs are conjugated and plurals are matched correctly, articles are automatically added to nouns that need them, etc. Some words in the original sentence skeleton might get replaced with a random choice of synonym. Neither of these major new features is actually hooked into the Conversation Engine yet, so I don't have any conversation examples to show off, but I'm hoping to be ready for that next month.